There are four distinct stages for real time reporting that is used in the contact center space. These stages provide the contact center manager an increasingly more granular look into the data and proactive alerting. The four stages are: Standard ACD Reports, Customized Contact Center Reports, Drill-Down Reporting, Proactive Reporting and Alerts. 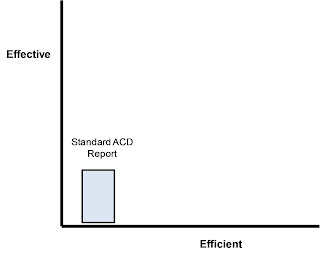 Standard ACD Reporting: This reporting is the standard reports that are offered by the ACD vendor. When the ACD vendor is asked if their product includes reporting they are quickly able to say yes. The reporting that is offered allows the vendor to “check the box” on the RFP from the customer. However, rarely does the reporting that is offered by the ACD vendor sufficient to meet the needs of a progressive contact center. 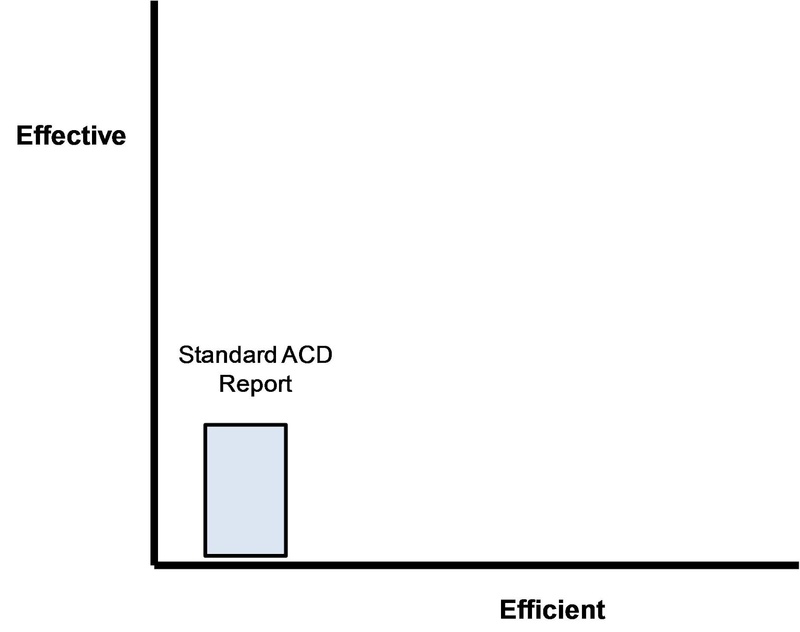 Standard reports from the ACD are very basic and offer little true value to the customer in today’s contact center. 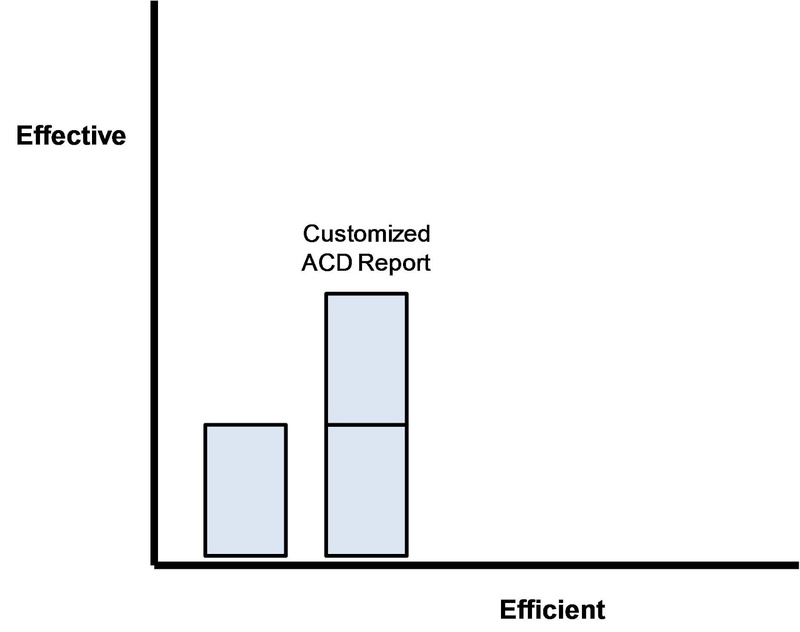 The standard ACD report provides the customer with statistics about the contact center. As we know statistics are not very useful when you are trying to improve the performance of the contact center. Sure the statistics can tell you things such as how many calls are in queue or what the longest wait time is or the average handle time. But these are not metrics which is what the contact center needs to improve performance in the contact center. As the Figure shows a call center will become more effective and efficient when adding standard ACD reporting for the managers to review. Customized Contact Center Reports: These reports are built by the ACD vendor or reseller to help meet the unique needs of the contact center. These reports provide the level of information the center specifically needs to become more effective and efficient. The biggest drawback of working with the ACD Vendors to do these custom ACD reports is they do not include data outside of the ACD. Contact center reporting needs to have information coming from sources outside of the ACD. By working with a qualified reseller or third party vendor that specializes in reporting tools the customized contact center reports can include other data sources. These sources should include: WFM, CRM, ticketing system, IVR and dialers. Customers should also provide access to data sources that include FCR and CSat ratings. Extracting data from these sources gives the contact center manager the ability to increase performance. 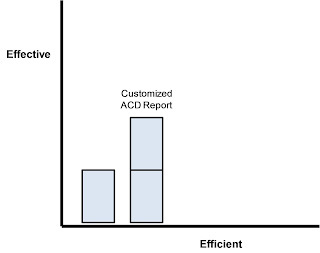 Figure changes from the standard ACD reports to customized reporting. These types of reports improve the call center effectiveness and efficiency by reporting on what is important to this particular call center. Drill-Down Reporting: Getting to the root cause of the problem should be the goal for the manager when the contact center is not meeting the SLA’s. 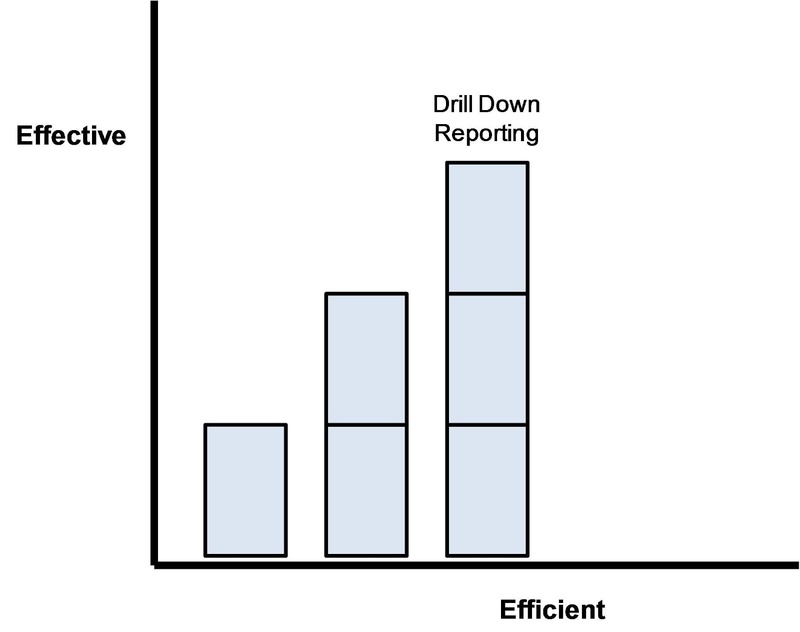 One way to solve the mystery of what is causing the problem is to use drill down reporting. This type of reporting contains a summary report as the first layer. This summary would show the manager that a metric has exceeded a threshold and requires further action. By being able to click on that metric the drill down reporting will go to a more granular report showing details about the metric helping the manager pin point the problem. By having custom reports that offer drill down the manager can quickly find the cause of the problem in real time and begin working on the problem today rather than tomorrow or next week. This immediate reactive behavior will improve contact center performance. 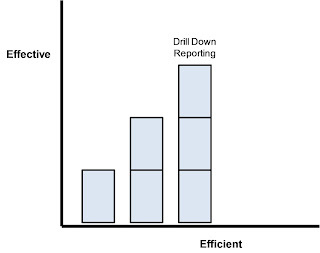 Figure illustrates the cumulative effect of adding drill down reporting and reporting in a proactive manner. Proactive Reporting and Notification: The effective call center manager does not wait until the end of the day or when there is time to review the reports. The effective manager has real time reports that are proactively sent to the manager at a scheduled time or when a call center variance has been exceeded. 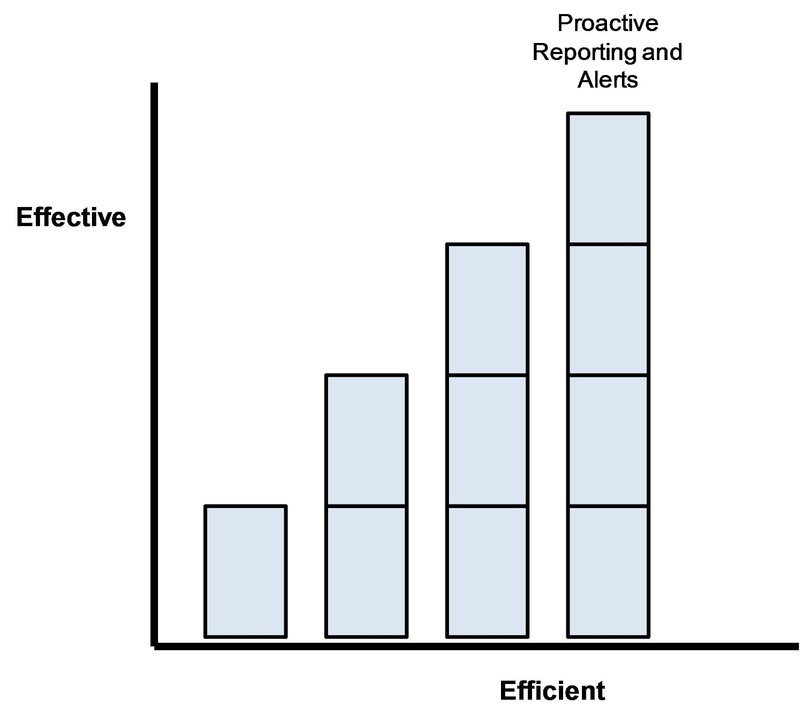 By having reports sent to the manager work can begin immediately rather than waiting to build the reports. In addition, by including preprogrammed notifications a manager will not have to wait until the scheduled report arrives the manager can be alerted when a metric has exceeded a threshold or contact center variance. Proactive reporting takes customized drill down reports and adds the ability to report on a scheduled basis or an alert basis. This level of reporting will make any call center more effective and efficient by reducing costs and eliminating waste and inefficient behavior. If the contact center is a sales / service center revenues can be increased as well by using the proper reporting methods. The progression of real time reporting goes through four stages with each stage building on the previous stage. 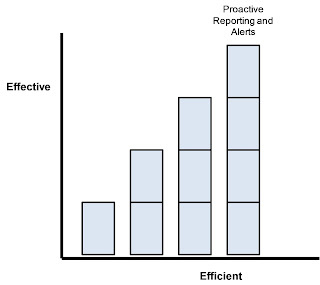 By moving to a proactive reporting tool from a standardize report a call center manager is quickly able to improve call center performance by creating an effective and efficient call center. Spectrum is a leading provider of Unified Contact Center Reporting. Contact Spectrum today to learn more about The Progression of Real Time Reporting in the Call Center.